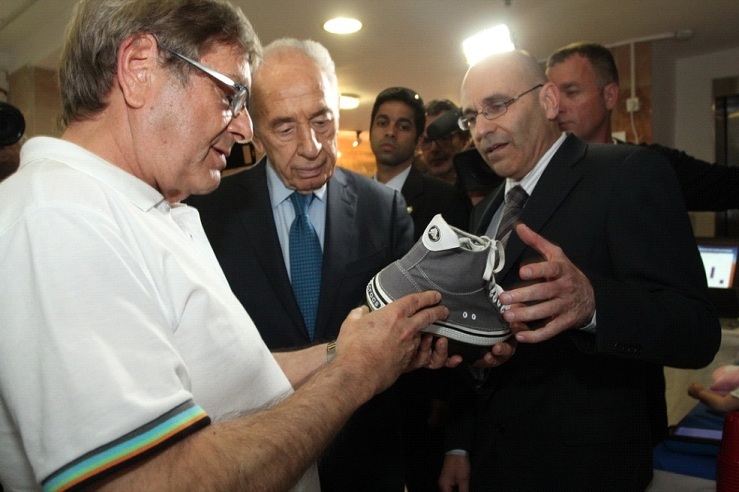 Step of Mind’s Re-Step™ training system was one of the Israeli inventions shown to President Shimon Peres during his visit at the Reuth Medical Center in Tel-Aviv. Re-Step™ – a mechatronic system that diagnoses and trains walking – was developed by Step Of Mind Ltd., an Israeli startup, The system is founded on an in-depth understanding of neuroscience and applies chaos theory to neurorehabilitation. Adi Farage, a university student who has cerebral palsy, underwent a set of Re-Step™ training sessions during her army service, which enabled her to gain stability while walking without crutches. “I was happy to demonstrate the technology to our President,” Adi said. “I was born with cerebral palsy and had to work very hard to be able to walk – a function that to others seems so obvious Re-Step™ uses patented technology to induce challenging and unexpected changes in the walking environment that vary with every step. The training resembles walking on uneven surfaces, such as rocks or sand at the beach. Studies have found that challenging training such as Re-Step™ is very effective in the walking rehabilitation of persons following brain injuries.